This was a great meal to come home to! Thanks My Soup for You! Last week, thanks to my local Macaroni Kid and their awesome giveaways, I won tickets to the Home Show that was taking place nearby. I was very excited, and we opted to go to the show on Sunday afternoon after church and after lunch. We’d be getting home just in time for dinner. Nothing’s worse than coming home at dinner time and trying to decide what to make for dinner. On the flip side though, nothing’s better than coming home to dinner already cooked for you while you were out! 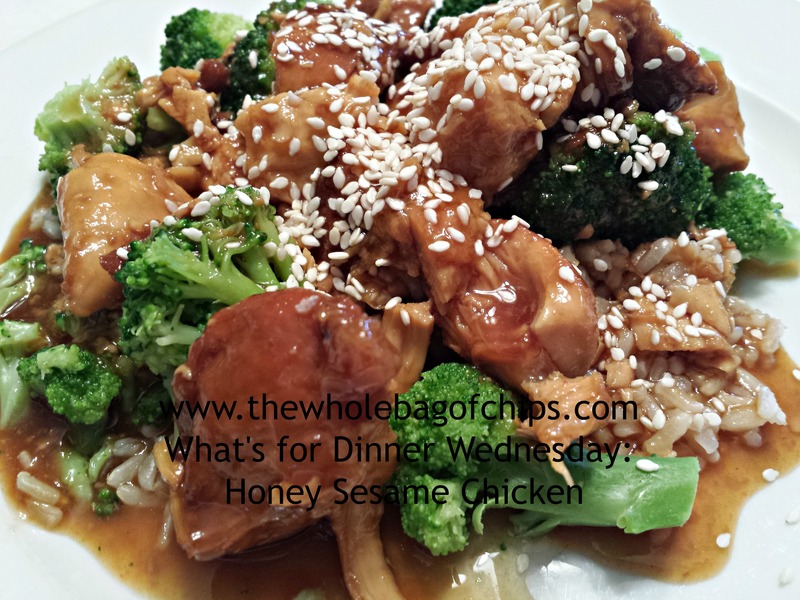 Therefore, when we planned our meal menu for the next two weeks, one of the slots was filled with a new recipe for Honey Sesame Chicken, thanks to a blog post I’d seen earlier that week on my friend Paula’s blog, My Soup for You. I knew when I saw it, that it was one I wanted to try too, and being a crock pot meal it fit in great with our Sunday afternoon schedule. Paula had gotten the inspiration for her meal from the Kitchen Whisperer, and she tweaked it to fit her needs. I followed Paula’s recipe almost to a “T,” only changing a few things, which I note in the recipe below with asterisks. Thanks to Paula for sharing her variation of the Kitchen Whisperer’s recipe with us! It made our Sunday afternoon stress-free and relaxing, and we had a delicious dinner! 1. Place the chicken in a 5 quart slow cooker that you have sprayed with cooking spray. 2. Combine honey – cayenne (no water, cornstarch or garnishes yet!) and pour over the chicken. 3. Cook on high for 2-3 hours. 4. When done, take the chicken out and leave the sauce in the pan. 5. Combine corn starch and water and make a slurry. 6. Pour that in the slow cooker with the sauce and mix. Cook for another ten minutes on high until it thickens slightly. 7. Chop up your chicken and put it back in the sauce. I also added about two cups of broccoli florets. 8. Serve with rice and garnishes. ← Monday Musings: What’s the objective? Did you put the broccoli florets in the crock pot cooked or raw? I used them at the end after everything was done and let people put them on or next to as they liked. Some just had it on the side.